During the last two weeks a flock of between 9 and 14 white-faced herons have been lingering on the green areas beside the Careel creek skateboard rink end. Although they will fly and land in a tree just over the channel if approached, they seem perfectly happy to secure food from the grass (worms?) and will stand and watch you if you stand quietly and watch them. Considering how many people, yelling youngsters and frolicking dogs frequent this path, their return on a daily basis is a delight for locals. These birds once thrived in large numbers in Pittwater, so much so, that Heron Cove, at Newport, was named after them. They also frequent, in good numbers, beautiful Careel Bay at low tide for feeding. Pictured here on Friday 6th of July, the White-faced Heron, Egretta novaehollandiae, also known as the White-fronted Heron, and incorrectly as the Grey Heron, or Blue Crane, is a common bird throughout most of Australia and is the one heron known to breed in Tasmania. It may be found almost anywhere near shallow water, fresh or salt. The species was originally described by ornithologist John Latham in 1790. The adult White-faced Heron weighs an average of 550 g and ranges from 60–70 cm in height. Immature birds are paler grey with only the throat white, and often have a reddish colour on the underparts. Chicks are typically covered with grey down. It is protected in Australia under the National Parks and Wildlife Act, 1974. Nomadic in nature, with a slow and ‘wave bounce’ style of flight, they will feed in groups like this during the non-breeding season (breeding season is Spring). These two lovely birds which look like small geese are actually a male and female Australian Wood Duck and were spotted on the green at Avalon on Friday afternoon. The Australian Wood Duck, Maned Duck or Maned Goose (Chenonetta jubata) is a dabbling duck found throughout much of Australia. It is the only living species in the genus Chenonetta. Traditionally placed in the subfamily Anatinae (dabbling ducks), it might actually belong to the subfamily Tadorninae (shelducks); the Ringed Teal may be its closest living relative. The Australian Wood Duck is widespread in Australia, including Tasmania. They are found in grasslands, open woodlands, wetlands, flooded pastures and along the coast in inlets and bays. They eat grasses, clover and other herbs, and occasionally, insects. During the middle of winter the tiniest flowers, with petals of velvet, seem to thrive in open patches of sun. The Australian Native Violet, Viola hederacea is a species of violet that is common and widespread in Victoria and Tasmania, along the Great Dividing Range in New South Wales north at least to the Barrington Tops area, in the far south-east of South Australia, and in a small area of the Adelaide Hills between Belair and Mount Lofty. It grows to about 10cm (4") tall, and spreads widely by means of trailing stolons that root at the nodes. The leaves are kidney shaped and bright green in colour. The purple and white flowers appear mainly in the warmer months, however this plant is rarely without a few flowers. Another of these is the Viola banksii, also called a native violet, and grown throughout gardens around Australia, especially in the east. 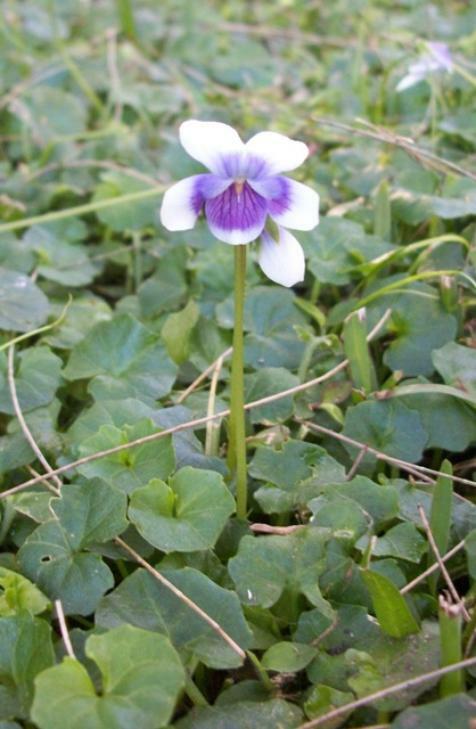 For many years it was known as Viola hederacea, however the species complex was revised in 2004 by Kevin Thiele. 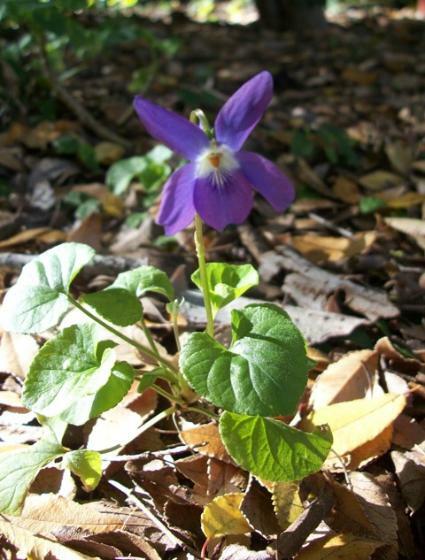 Although the Native Violet was initially collected by Banks and Solander, the type specimen was either lost or not provided until a collection by Jacques Labillardière in Tasmania. He discovered that the original type specimen of V. hederacea collected by Labillardière was not the same as the hardier and showier plant later collected, cultivated and widely sold. This second form, native to the New South Wales coast from near Brisbane to Batemans Bay, he named Viola banksii. This species is distinguished by its striking purple and white flowers. As well, the fully developed leaves are almost circular in outline with a deep, narrow, v-shaped sinus at the base, and are usually rather bright, fresh green. Viola is a genus of flowering plants in the violet family Violaceae, with around 400–500 species distributed around the world. Most species are found in the temperate Northern Hemisphere, however some are also found in widely divergent areas such as Hawaii, Australasia, and the Andes. Some Viola species are perennial plants, some are annual plants, and a few are small shrubs. A large number of species, varieties and cultivars are grown in gardens for their ornamental flowers. In horticulture the term "pansy" is normally used for those multi-coloured, large-flowered cultivars which are raised annually or biennially from seed and used extensively in bedding. The terms "viola" and "violet" are normally reserved for small-flowered annuals or perennials, including the species. The flowers, leaves and roots of various Viola species are used for medicinal purposes, being rich in vitamins A and C. They also contain a type of antioxidant called an anthocyanin. Viola flowers are also used to make an herbal tea that is used in Chinese herbal medicine. Most violas (all tested) and many plants of the Violaceae plant family contain cyclotides, which have a diverse range of in vitro biological activities when isolated from the plant, including uterotonic, anti-HIV, antimicrobial, and insecticidal activities. Jacques-Julien Houtou de Labillardière (1755–1834) was a French naturalist noted for his descriptions of the flora of Australia. Labillardière was a member of a voyage in search of the La Pérouse expedition. He published a popular account of his journey and produced the first Flora on the region. 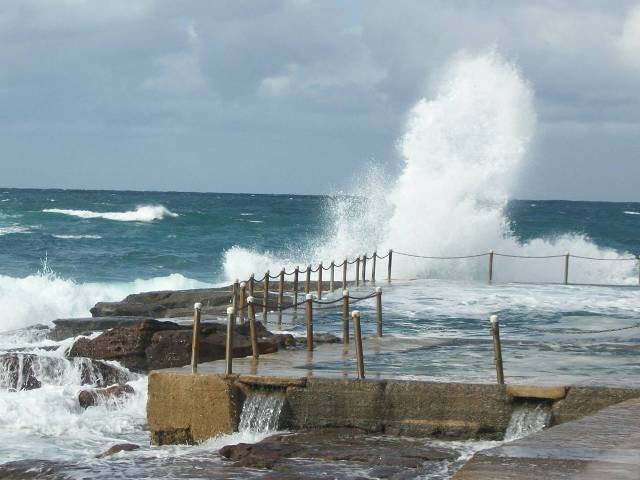 Wind driven swell made for exhilarating leaps of foam as waves met pools most of this week. A breath of fresh air for all your senses. One of the loveliest sights during July each year is the bright yellow and yellow-white flashes of wattle. These brilliant flowers fairly glow in even dull light and can be difficult to capture so you may see the delicate yellow fringes of their flowery spikes. Those currently out in Pittwater are Acacia sueaveolens and the Coastal Wattle Acacia longfolia. Those shown here form part of dune stabilisation and wetland rehabilitation projects in Pittwater. Acacia suaveolens was first described as Mimosa suaveolens by renowned botanist J.E. Smith, the founder of London’s Linneaen Society. He never visited Australia and described the plant from one grown from seed in the Sion gardens in Waterford, Ireland. Sweet scented wattle (A. suaveolens) draws it name from the small clumps of flowers that occur during winter and early spring. In its native habitat it is one of the earliest flowering of the wattles. It is common in the bushland surrounding Sydney and occurs from southern Queensland down the east coast into Tasmania. A. suaveolens has bi-pinnate leaves only in very juvenile specimens. Phyllodes (modified leaf stalks) rapidly develop as the plant matures. The phyllodes are without hairs (glabrous) and are usually covered in fine white powder (glaucous). Coastal Wattle (Acacia longfolia) is a species of Acacia native to south-eastern Australia, from the extreme southeast of Queensland, eastern New South Wales, eastern and southern Victoria, and southeastern South Australia. Common names for it include Acacia Trinervis, Aroma Doble, Golden Wattle, Coast Wattle, Sallow Wattle and Sydney Golden Wattle. It is a tree that grows very quickly reaching 7–10 m in five to six years. Spotted this week; the first snowdrop for this year, a sure sign Spring is not too far away. The snowdrop, Galanthus (Snowdrop; Greek gála "milk", ánthos "flower") is a small genus of about 20 species of bulbous herbaceous plants in the family Amaryllidaceae, subfamily Amaryllidoideae. Most flower in winter, before the vernal equinox (in Australia this year the Spring equinox will occur on Sunday, 23 September 2012, 00.49am EST ), but certain species flower in early spring and late autumn. Native to Europe these flowers are perennial, herbaceous plants which grow from bulbs. Each bulb generally produces just two or three linear leaves and an erect, leafless scape (flowering stalk), which bears at the top a pair of bract-like spathe valves joined by a papery membrane. From between them emerges a solitary, pendulous, bell-shaped white flower, held on a slender pedicel. In the UK there open garden days that celebrate Snowdrop Festivals. It was suggested by Andreas Plaitakis and Roger Duvoisin in 1983 that the mysterious magical herb moly that appears in Homer's Odyssey is actually snowdrop. An active substance in snowdrop is called galantamine, which, as anticholinesterase, could have acted as an antidote to Circe's poisons (1). Galantamine (or galanthamine) can be helpful in the treatment ofAlzheimer's disease, though it is not a cure; the substance also occurs naturally in daffodils and other narcissi. 1. Andreas Plaitakis & Roger C. Duvoisin (1983). "Homer's moly identified as Galanthus nivalis L.: physiologic antidote to stramonium poisoning". Clinical Neuropharmacology 6(1): 1–6. DOI:10.1097/00002826-198303000-00001.PMID 6342763.